Time to go a little bit retro with Gekkeikan’s premium junmai ginjo sake! This quality pure rice wine (made without the addition of any brewer’s alcohol) has a distinctly florid and fruity aroma and refreshing, rice-prominent flavour, with a finishing aftertaste that cuts through everything else. 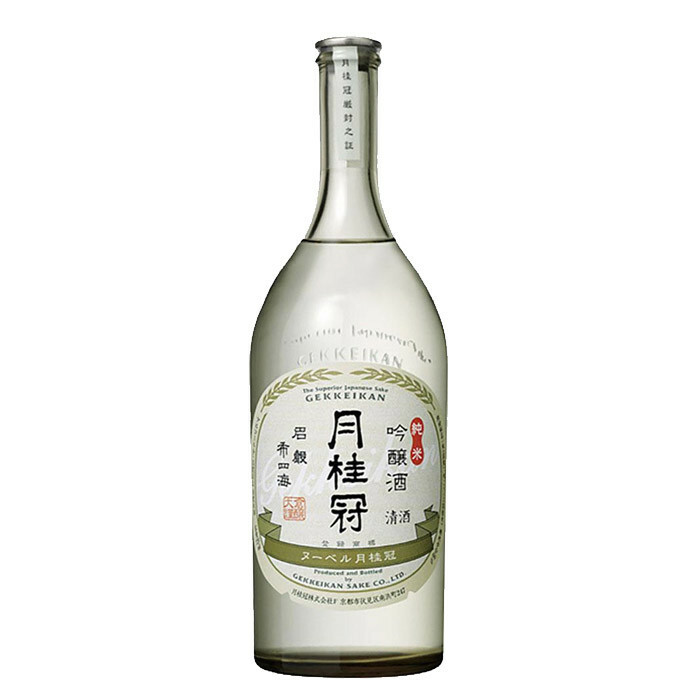 Beautifully packaged in a unique smoky coloured glass bottle, this slightly dry, slightly light-bodied sake is at its most delicious served chilled or at room temperature with full-flavoured foods. Using a new approach (hence the “Nouvelle”) based on a traditional style and packaged in a sophisticated modern style bottle, this Nouvelle series has its signature style of light flavor and a 15% alcohol level. This is a clean, crisp Jummai Ginjo that is aromatic and fruity with rich umami flavor. This superior grade Japanese sake is a four-time gold medal winner at the prestigious Monde Selection awards. Flavour: Slightly dry, refreshing, slightly light-bodied. Full flavoured and meaty foods such as yakitori chicken or ankake meatballs.